The granddaughter of a freed slave, and daughter of a Pullman Porter, Ethel L. Payne was surrounded by a family with a strong work ethic at an early age. Despite her father’s death at the age of 12, leaving behind 6 children, Payne’s mother, who cleaned houses and took in lodgers encouraged Payne’s gift with words. During a time where other families would have had to rely on an extra hand in the workforce to bring in extra money, Payne’s mother urged her to attend Lindblom High School, a school in a white district. Payne’s road to journalism was a surprise one. Seeking change from her role as a matron in a girls reform school and as a Chicago Public Library clerk, Payne went overseas to serve American forces in post-war Japan with the Red Cross. During the sea voyage Payne kept a diary, detailing her experiences and illegal and immoral practices within the military. This diary was passed along to a reporter from the Chicago Defender, and her entries were published in the U.S. as front page stories about the experiences of African American soldiers. This opened the door for Payne to become a reporter, with nation’s leading black newspaper, writing full time in 1951. Payne was a force in that role covering key civil rights issues, interviewing President Eisenhower, Nixon, Vietnam, Nigerian Civil war and making a name for herself as one who never shied away from asking the tough questions. For Payne, hard news dominated her interests, and while other women were forced sometimes to cover “women stories” or fluff pieces about homemaking, and cooking she never let a gender stereotype set her agenda for what she would cover. In 1970, Payne became the first African American female radio and television commentator on CBS, the first black female to have that role on a national network. 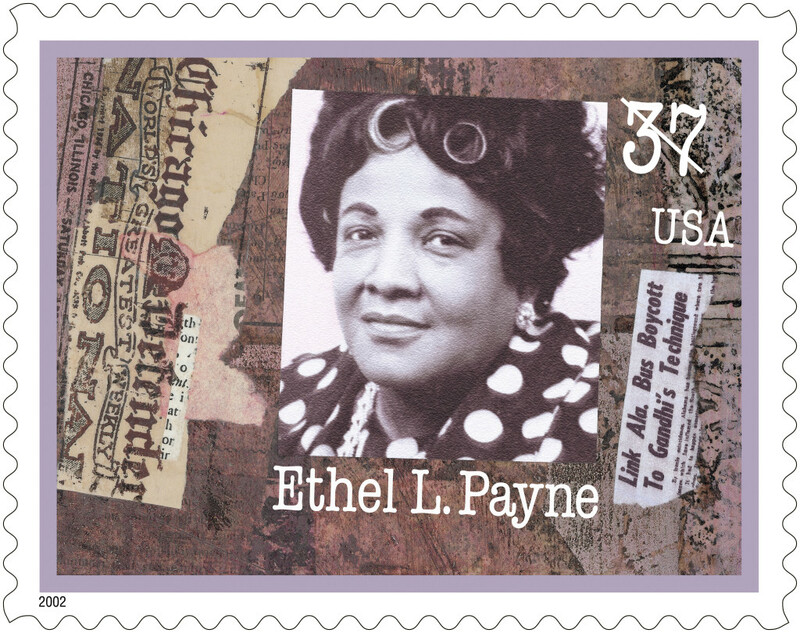 Yet, in 2002 Payne and her incredible journey of being a journalist dedicated to the plight of Blacks striving for equality in America, and shedding light on international topics, was honored with a likeness on a U.S. postage stamp. Today, we remember, Ethel L. Payne, who used her words to uplift and champion causes across the board, and who was not ashamed to to ask tough questions, and get answers. ← Girls Do Video Games Too…Even Better!